1903: Missouri and Nebraska hit a scheduling impasse that would lead to an eight-year break in their football series. The teams had played each other every year from 1893 to 1902 but wouldnt meet again until 1911. 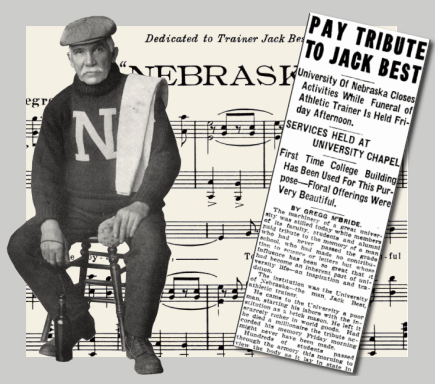 «1923: Athletic trainer Jack Best, a fixture at Nebraska since before the dawn of NU football and one of the most beloved characters on campus, dies at age 77. Tributes to the Englishman had long been common, and they include this 1913 journal page, this 1917 song and this 1922 book segment. His passing on Jan. 23, 1923, came less than two months after his locker room speech moved players to tears before the 1922 Notre Dame game. 1928: Nebraska pursues (successfully, it turns out) a game with Army after the military academy's series with Navy goes on haitus in a disagreement over eligibility standards. 1993: Bob Devaney confides to the Kansas City paper about the unsatisfying end to his tenure as athletic director. Meanwhile, Tom Osborne searches in Florida for more Manatee County talent. 1998: Southen Cal athletic director Mike Garrett announces a 2006-07 series with Nebraska. 2003: The redesigned uniforms of 2002 appear to be on the way out. 2008: After a flirtation with Alabama, Shawn Watson decides to stay in Lincoln as offensive coordinator. 2013: Former Husker quarterback Scott Frost moves up to offensive coordinator at Oregon as Mark Helfrich becomes head coach.